This award is to be presented in the memory of Dr. Byrnne Rothwell in recognition of the contributions he made to the equine industry within the province of Saskatchewan. Dr. Byrnne Rothwell was born in Nipawin, Saskatchewan, and was involved with animals and in volunteerism from an early age. He started as a 4-H member and for 65 years he was either a member, leader, mentor or a part of the Saskatchewan 4-H Council. Graduating from the Ontario Veterinary College in 1964, he practiced in Mission, BC, Wakaw and Birch Hills, SK, before settling in Shellbrook, SK in 1970. During this time he also served on the Saskatchewan Veterinary Medical Association committee, including the Council, and was President in 1976-1977. In 1987 he sold his private practice and joined the Canadian Food Inspection Agency, working in locations that included Moose Jaw and Saskatoon. Dr. Rothwell’s incredible career included many accolades and awards, and he was highly sought after for advice from governments and non-profit organizations alike. He was a lifetime member of the Canadian Veterinary Medical Association. Dr. Rothwell was a long-serving member of the Saskatchewan Horse Federation Board of Directors and following his retirement from the CFIA, continued serving the Federation by assisting with preparation of the organization’s disease alerts and health recommendations. He was also a valued volunteer on the Equine Canada Health and Welfare Committee. In 2000 Dr. Rothwell was named Saskatchewan Veterinarian of the Year. In 2011 he was awarded the Equine Welfare Leadership Award of Distinction from The Farm Animal Council of Saskatchewan and the Saskatchewan Horse Federation, for integrating animal welfare into his core business strategy and setting the bar higher for expectations regarding animal welfare. 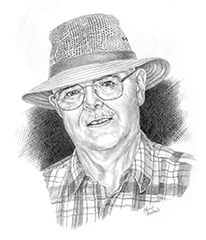 In January of 2014 Dr. Byrnne Rothwell passed away, and in 2015 he was posthumously inducted into the Saskatchewan Agricultural Hall of Fame in recognition of the contributions he made to the equine industry in the province of Saskatchewan. Norah Ridley of Osler, Saskatchewan. Norah's essay subject was Conditioning the Event Horse. She is attending the University of Saskatchewan's College of Arts and Science, and plans to pursue a degree in actuarial science at the University of Regina. Rachel Schwinghamer of Moose Jaw, Saskatchewan. Rachel's essay subject was When to Start a Young Horse. She attended Saskatchewan Polytechnic for a Combined Laboratory and X-Ray Technology program. Courtney Pickard of Saskatoon, Saskatchewan. Courtney wrote her essay on Septic Arthritis, and attended the University of Saskatchewan Arts and Sciences. Makayla Rettger of Aberdeen, Saskatchewan. Makayla attended the University of Saskatchewan with a Bachelor of Science in Engineering and Major in Geological Engineering. Her essay subject was Health and Welfare Issues in the Equine Industry: Western Pleasure.